Steven Abbott Associates LLP, acting as professional planning advisor and agent, has secured outline planning permission on behalf of Mainsprint Ltd for a residential-led mixed use scheme on a former quarry site, East Quarry, in Appley Bridge, West Lancashire. 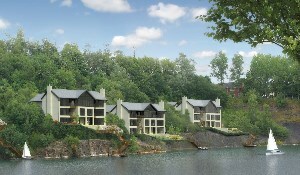 The proposals include houses around the quarry bank, a hotel, a restaurant and innovative floating homes on the water which has filled the quarry void since quarrying operations ceased. The approval is the result of many years work by Steven Abbott Associates LLP who have been involved since successfully arguing that the site should be allocated for development in the 2004 West Lancashire Local Plan.